The Red Roller is the ultimate in all-season maintenance, you need to control the air pockets for wet to dry versatility. By compressing the air out of the soil you are allowing more water to runoff and you will have less percolation so it will dry faster. Being able to use your arena sooner means you will have less downtime. 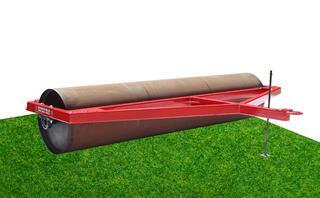 The red Roller should be filled with water to achieve the proper weight. Hitched to your harrow, you can tighten up the surface by compressing the air out — again, which will allow more water to runoff. The Red Roller can be pulled by a tractor only or behind any of the Red Master Harrow line as harrow-roller combination.